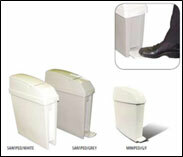 The sanitary bin is operated by foot pedal. This helps in preventing cross contamination. Due to staff count on your premises the service cycle on this unit is 7 to 14 days. The unit will be serviced by Scientific Health Care.